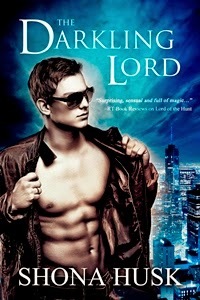 Now scheduling a One Week Tour for Shona Husk's upcoming Paranormal Romance release, The Darkling Lord. Shona was the winner of Red Moon's One Week Tour giveaway! You can sign up for a Spotlight or Review. If you're interested, please email me with your available dates March 16 - 27. If you're signing up for a review, please let me know what format you would like (mobi, epub or pdf). This time, though, he’d have fairy magic on his side. Or at least in his possession, if not exactly on his side. He glanced at Darah. “So, Darah, what did you do to end up here?” The cup warmed his hands. Summer was fast becoming a memory as autumn took hold. She paused, the cup almost to her lips. After being surrounded by humans and the ugly and awkward Greys for so long, her beauty was like a rose growing among the weeds in sidewalk. Something rare that made him pause. Her tongue darted over her lip. He shivered, unprepared for the spark of lust the thought ignited. He’d spent a long time keeping those kinds of thoughts deeply buried, and he wasn’t entirely sure he wanted to release them. Certainly not with a woman he barely knew and didn’t quite trust. Although to be fair, most of his encounters had involved women for whom kissing wasn’t part of the job. It was safer for everyone, even if it didn’t satisfy the ache. Darklings didn’t get to love. Any human he did love would eventually die. And Greys, he’d tried once. It was easier to go without. “If you were exiled before the power shift and the change of Kings, you’d be dead.” All fairies caught on the wrong side of the veil had died, only the Greys had survived because they were already cut off from the magic. “Don’t lie to me.” He wasn’t a mortal fool who knew nothing of Annwyn. She sipped her soup but didn’t answer. No confirmation or denial. He was taking that as an affirmative. He leaned back. This one had teeth and cunning; he was going to have to watch her closely. It had been a long time since anyone had roused the thrill of a hunt and the chance of a good game. Damn his fairy blood for that one too. “Why Detroit?” He smiled, and plucked some of the bread. It was always made fresh, but it really needed butter. “Very well, a truthful answer for a truthful answer.” All fairies loved a deal. Was she enjoying the idea of a game as much as he was? How far was he willing to take it? It was a delicate dance and he couldn’t afford to gamble too much, nor get too distracted. “That’s an acceptable deal.” She smiled and her gaze sharpened. He exhaled as lust traced a razor edge over his skin. If he mis-stepped, dancing with Darah was going to hurt.